Pencreek Cottage, our most popular property of 2012 situated between Truro and Falmouth. 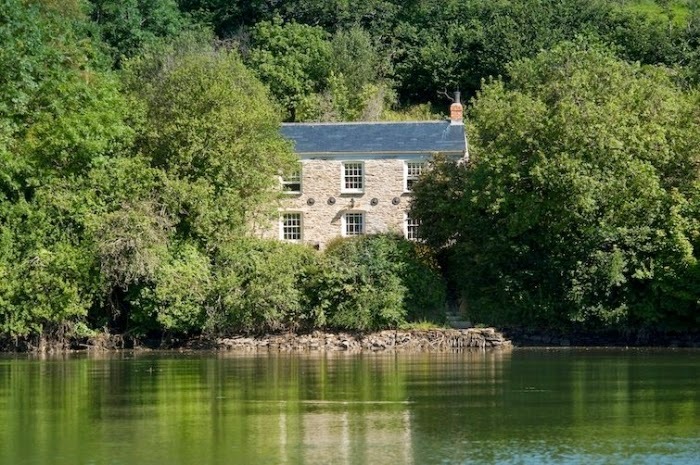 This property has the following atributes: luxury, secluded, wild escape, wood burner, creekside location, 10 minutes from the centre of Truro. Pet friendly. Available Saturday 9th - 16th Feb £449.00, sleeps two. Bosun's Locker, tucked away in St Mawes, moments from the harbour. Available Saturday 9th - 16th Feb £289.00, sleeps two. Available Saturday 9th - 16th Feb £289.00, sleeps two. Within walking distance of The Watch House restaurant, who will be offering a 2 or 3 course menu on the night, or The Victory Inn for great food and local beer in an intimate pub setting. Swallows, situated on the harbour front with a small balcony for sitting out. Fabulous sea view across the harbour towards Flushing. Within walking distance of shops, restaurants, boat trips, and numerous pubs. Vineyard Cottage, gorgeous little reverse level cottage tucked away on an old vineyard. Glorious wooden beams, tastefully furnished, remote peaceful location. A short drive from The Roseland Inn, for fab food by a roaring fire. Available Saturday 9th - 16th Feb £319.00, sleeps two. Short breaks: Toadstools, pet friendly, sleeps 4, available for a short break, Thursday 14th - 17th Feb £307.30. Lavinia Cottage, pet friendly, sleeps 3 available Thursday 14th-17th Feb £278.30, or a full week Sunday 10th - 17th Feb, £369.00. Mikes Place, with sea views, sleeps 3, with a seasonal discount, Thursday 14th - 17th Feb £201.30 or a full week Thursday 14th - 21st Feb £309.00. If none of the above catch your eye do email us with your requirements and we'll send you some of our other great properties to look at. If you're interested in eating out in Truro, we'd throughly recommend Mannings Restaurant. They have a popular cocktail bar as well as a great choice of food. Bustopher's Bistro, is where we all treat ourselves, excellent interesting food, with an extensive cocktail and wine list. Alternatively if you're looking to add a little spice to your night, then Baba Indian Restaurant is a great little place, please note they only accept cash. Booking is definitely advisable for all establishments for Valentine's Day, or weekend evenings at anytime of year. As mentioned in our January Newsletter, there are many local businesses who can supply local flowers, here are two who grow and sell their own products: Tregothnan, specialise in sourcing local flowers and mixing with their own foliage. Fentongollan Farm, grow locally bred daffodils and can post simple splashes of colour to fill several vases! Do please note you must be present to received deliveries at your cottage, and we can't guarantee what sort of vases any cottage may provide. Best to take your own just in case!